I think it’s safe to say we can now stop worrying about whether the Mets would win Game 3 of their National League Division Series against the Dodgers, or more specifically, against Chase Utley. He was enough of a thorn in the Mets’ side when he played second base for the Phillies before his sinister slide took out our spirited shortstop Ruben Tejada Saturday night in LA. At first glimpse, it looked to me like Tejada had kneed Utley in the head since his helmet flew off as they collided, and I assumed he’d be on the receiving end of a concussion. But the damage was much worse for our side. Tejada had broken his right leg, the out at second was overruled, the run counted, and the Dodgers were suddenly on the rebound as our player was carted off the field and headed for the DL. Now in the twilight of his career, the 36-year-old Utley has always played the game hard. As a second baseman he’s been on the receiving end of more than a few take-out slides himself. When he’s been in the batter’s box, he’s been plunked so many times he’s earned a hit-by-pitch ranking in the record books—right up there with Alex Rodriguez, who’s also “taken one for the team” many times in his Yankee Pinstripes. Like our version of the Roman Games, Mets fans wanted blood. Had I been at Citi Field Monday night, I’m sure I would have loudly joined in the Greek chorus chanting “We Want Utley!” until my throat hurt. I’m glad Joe Torre, acting as the Majors’ chief baseball officer, suspended him for two games because he went into the slide rather late. Through the players union, he’s appealing his suspension, and the process could drag on for a while. So be it. Just having Utley around was enough to motivate the hometown crowd. But would it be enough to focus the Mets? 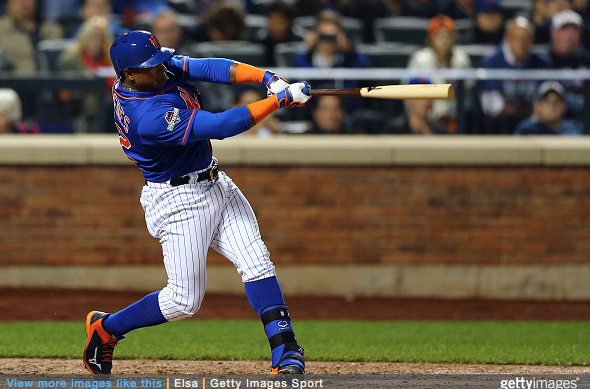 By the second inning, doubts were on the upswing in New York as Los Angeles had a 3-0 lead. The Mets players were seething, hungering for revenge—as were legions of fans. Collins reportedly discouraged our Game 3 starter, the Dark Knight himself, Matt Harvey, from seeking retaliation because Collins knew that Harvey would have been ejected immediately—and our bullpen is shaky enough in long relief—except for that amazing 42-year-old Bartolo Colon, who can shake it and not break it—and he has a whole lot to shake when he mounts that mound. What was the matter with the Dark Knight? We wanted revenge! Harvey gave up four consecutive singles. Had Collins been a downer? Not to worry! Of course, being a true Mets fan means never not worrying. The team did roar back, thanks to Dodgers starter Brett Anderson, one of the weak links in their strong rotation. In the bottom of the second inning, our hyper right-fielder, Curtis Granderson blasted a three-run double that just missed being a home run. Before we could exhale, our team had not only tied the game, they’d taken the lead. What hit was sweeter in Game 3? Some may claim that Yoenis Cespedes’s three-run homer to the upper deck—431 feet from home plate—took the cake. I loved that, too, but I think Travis d’Arnoud’s two-run shot was the icing. Until then, he’d been in a bad playoff slump, 0-for-7. We need his bat to come alive and it finally did. Somebody always seems to step up on this 2015 team—when they’re hot, that is. One day it’s David Wright—and to me, his two-run single, which turned out to be the game winner, in Game 1 was just such a tribute to his inspiring work ethic, his constant pain, and his valor. Another time up comes Daniel Murphy or Lucas Duda to make a difference. You never know. The Mets scored 13 runs in all—a franchise playoff record. But no lead is ever enough for the Mets, as far as I’m concerned. After Harvey put the Mets in a three-run hole, he told Collins it’d go no deeper. He had a tough game but he proved his worth. Harvey had thrown 97 pitches through five innings, nearing his do-no-harm limit. With typical flourish, Colon came in and struck out the side. The next inning Colon gave up a run, so Collins had our great rookie phenom Michael Conforto pinch-hit for him, and he came through with a deep sacrifice fly. Could we begin to relax? Are you kidding me? We’re coasting into the ninth inning, 13-to-4, and the next thing we knew a forgettable pitcher named Erik Goeddel—and the sooner the Mets forget him the better—had given up a three-run homer and a single. That comfy cushion the Mets had built up didn’t feel so comfortable. Certainly some fans had departed the stands or switched off the game because they actually had to show up for work Tuesday morning, and they are blameless, but those who could afford to stick it out knew the truth: It ain’t over til it’s over, as the great philosopher of baseball, Yogi Berra, used to say. Just beyond the base paths lies the abyss. Here we were, Game 3, a must-win for the Mets given all that had transpired in Game 2. There were no outs. The Dodgers were threatening. The skies were darkening. So when Collins motioned to the bullpen and brought out our closer, Jeurys Familia, to finish what Harvey had started, it all made perfect sense. Of course, it wasn’t a save situation—the Mets had a six-run lead. But give Collins credit. He has embraced the Mets’ existential condition. Watching the lead shrink by another run or two (or three, god help us!) would have let all the good feeling of revenge and triumph slip away. Who let the dogs out? Defeat, which had seemed so improbable, suddenly seemed plausible. Just like that, it began to feel like the worst day in July when the Mets couldn’t do anything right—and our captain, David Wright, was nowhere in sight. Oh, let us rejoice that the mighty Familia was on our mound Monday night. With his command, the inning was soon mercifully behind us and victory was ours. So now we can start worrying about Game 4.